Here at Reddish News, we like to keep you in the loop about what’s going on locally. After all, that is the idea behind the site! Are you interested in Reddish and want to learn more about the social history connected with the area? If so, why not join the accompanied walks around the cemetery’s heritage trail and listen to some interesting and sad stories of the people buried there? This weekend, Saturday 8th September at 11.00am and 2.00pm the Friends of Stockport Cemeteries will be holding guided tours. A free booklet of the History of Willow Grove will be given to all those who join the walk. If you’re interested then simply meet the guide at the main gates. This looks great to the point where we’ll be attending and reporting back on it next week. Need advice and think that your local MP is the person to turn to? Well, you’re in luck. Andrew has designed a new poster telling you exactly how to contact him. If you feel that you need to talk about a more pressing local issue then our local councillors also hold drop in sessions. 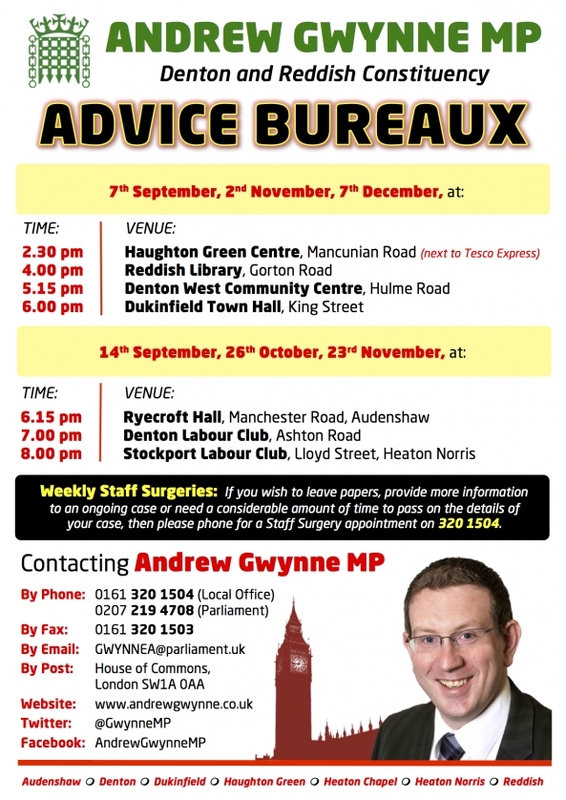 All Reddish Councillors hold regular advice surgeries where you can drop in without an appointment to discuss any issues that are worrying you about where you live. Kate, Paul and Dave do their main surgery on Wednesday evenings each week on a rota at Reddish Library on Gorton Road from 7pm to 7:45pm. They are also available on the second Thursday of each month as part of the Poet’s Corner Action Group meeting for residents at the Mike Doyle Centre on Browning Street. There is a private area available here for anyone who needs a confidential chat. Andy, Tom and Walter run a weekly advice bureau every Friday at the Triangle Church on Sandy Lane from 6pm to 7pm. Again, you don’t need an appointment. Based in Broadstone Mill, Simon Antony is a Digital Design company that is currently recruiting. If you’re a Dotnet or front end developer, then this could be just what you are looking for. “Simon Antony are a team of passionate experts and we love working with like minded people. Through continual research and innovation we seek to offer best practice in everything we offer clients so obviously we look for the best people to work with us!